Blockchain-based contracts have the potential to transform the way agricultural commodity trade is conducted, building trust between buyers and sellers, encouraging banks to fund transactions and empowering farmers to command a fair price for their produce. Tech companies, banks and commodity exchanges have been quick to see the opportunity, investing in a flurry of agriculture-focused platforms and pilots across ACP countries. But while some of these initiatives are already gaining momentum, blockchain technology is not a silver bullet and real-world solutions must still be found for real-world problems. Distributed ledger technology has many theoretical applications for agricultural commodity trade and finance, states Max Mattern, author of a recent CGAP brief. By allowing several parties to view agricultural assets on a ledger, the technology injects transparency into commodity trade, while the ability to create digital records of assets on a distributed ledger means they can be used as collateral for lenders. Smart contracts also mean asset ownership can be transferred automatically in the case of default. Ledgers can be used to track the origin and shipment of commodities, improving supply chain management, while they can also be used to build and store credit data on buyers and sellers, improving their access to finance, Mattern notes. In 2018, Nigeria-based tech start-up Binkabi teamed up with local commodities exchange Afex and Sterling Bank to create a blockchain-powered, automated trading system. Under the system, farmers deposit crops at Afex warehouses and receive a receipt that verifies their ownership. The receipt is converted into a digital token for trading on Binkabi’s platform, allowing farmers to sell to a bigger pool of buyers – such as processors – which deposit payment with Sterling Bank. The bank also accepts the token as collateral for loans of 50–70% of the value of farmers’ produce. This is the first time that Sterling Bank – which has committed to providing at least €24.1 million (₦10 billion) of finance for crops including maize, rice and soybeans via the Binkabi platform – has agreed to lend on the back of warehouse receipts alone. This is partly because of the certainty provided by blockchain-based smart contracts, which are automatically voided if any party defaults, with the token returned to whoever is selling it. Binkabi founder Quan Le notes that, after harvest, farmers under pressure to repay input financing are seeking an immediate sale. At this time, sellers in the market outnumber buyers, depressing the crop price. However, being able to access upfront funding allows farmers to wait until the stored produce commands a better price, rather than being forced to sell to the first buyer. Brokers also typically take more than 5% of the sale value as a fee, compared with Binkabi’s introductory rate of 1.25%, divided equally between the buyer and seller. The digital warehouse receipt also offers certainty to buyers and lenders that they are not paying for, or lending against, goods that have already been sold, which can be a risk with paper invoices or receipts, states Le. 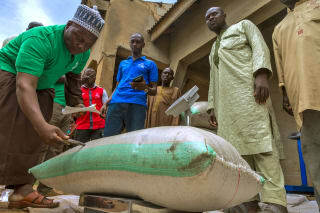 Since its launch in December 2018, more than 100 farmers have signed up to Binkabi for its pilot with Afex. Binkabi has also partnered with local fertiliser company TAK Agro to help it acquire a license for another exchange that will run on the same platform. Le predicts the total value of transactions over the platform will reach €4.4 million to €8.8 million this year but predicts a long ramp-up period. Smart contracts are also used by digital payments provider, Cellulant, to facilitate commodity trade in Nigeria via its Agrikore platform. This allows buyers to draft contracts using an Agrikore template, under which they offer to pay a certain amount for a specified quantity and type of agricultural commodity, explains Cellulant co-founder and CEO Bojaji Akinboro. These are then published to farmers, who can agree via SMS to fulfil contracts of their choice. Buyers fund contracts in advance – either in cash or through a debt obligation – so that sellers are automatically paid as soon as delivery is made, making the contracts effectively self-enforcing. Logistics companies, warehouses, insurers and banks can also be written into the same smart contract. Blockchain technology’s greatest benefit for agriculture in Africa is its ability to help overcome trust issues that plague the sector, says Akinboro. The platform provides an identity management service to guarantee to participants that they are dealing with real, traceable entities. In the first two months of its pilot launch in November 2017, the Agrikore platform – which currently supports trade in maize, rice and soybeans and will soon add sorghum – facilitated €1.7 million worth of trade. This rose to nearly €17.5 million in 2018 as farmers and big buyers like Olam Nigeria quickly became more comfortable with the technology, states Akinboro. By 2020, Agrikore aims to expand this to €262 million as more banks sign up to the platform – with two banks currently in final talks. Nevertheless, while banks and tech firms have rushed to embrace distributed technology, it is important to look beyond the hype, recognising what blockchain can and cannot do for commodity trade, cautions Mattern. With regards to trust, for example, automated payments can effectively enforce the smart contracts that underpin blockchain-based trade, but disputes regarding the quality of commodities post-delivery still require external resolution. The technology will gradually evolve to address more ‘real world’ problems as governments create legal and regulatory frameworks to support it. Only then will blockchain’s potential in agricultural commodity trade be fully realised, he concludes.